Who needs a quick, easy meal that still tastes amazing and makes your body feel great? Everyone! Throw in the facts that it’s vegan, gluten-free and as tasty as takeout… And we have a winner, people! 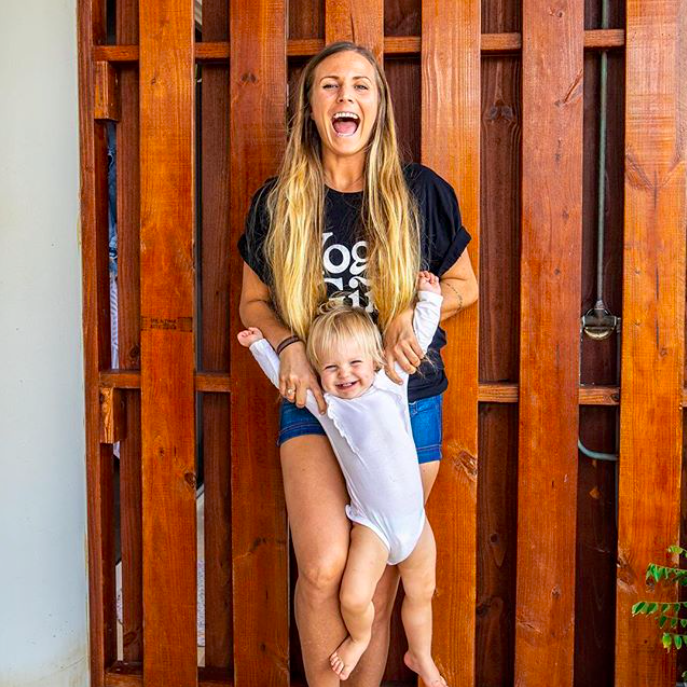 You know those days… You’ve spent your day chasing your toddler (and wishing you could have a sliver of their unlimited energy), you’re starting to feel a little under the weather, or there just isn’t time to cook a proper meal. Maybe all three! On these days, takeout dinners are a treat and a godsend. But often those meals get their addictive flavors from additives and chemicals! It’s time to find that same takeout taste but with ingredients your body will thank you for! My mom was visiting us in Aruba and we were having a totally crazy day. You know those days when you completely forget to eat, or you want to but there’s no time, so you grab a cookie or black coffee and call it good? Well, mom to the rescue! This is an absolutely delicious dish that my mom whipped up for the family during this insanely busy day, and I was amazed by the taste AND how quick and easy it was to make! Guys, it tasted like takeout! I just had to snag the recipe to share with you guys. I love rice noodles because you can pair them with almost anything, and they are so easy to make! This salad is filling and super delicious. Enjoy it on a warm summer night with a cold beer (or some ginger lemonade! ), or in a much deserved 10-minute pause in your busy day (those emails or chores can wait 10 minutes). The broccoli gives your body vitamins and minerals that support glowing skin, a strong immune system, eyes and heart, and it removes toxins and free radicals. The bell peppers help your skin, immune system, sleep, mood, cholesterol levels, and inflammation levels. Kale is a source of protein (you heard me! ), fiber, and vitamins and minerals that support your brain, blood sugar, and happiness. Spinach helps your skin, hair, bones, eyes, muscles, heart, brain…. There isn’t much this veggie doesn’t do! Lime is great for digestion, blood, kidneys, skin, and fighting infection or inflammation. Grapeseed oil, sesame oil, and olive oil all make great lotions. Grapeseed oil is the topical form of vitamin E and can help your hair grow, sesame oil is an antibacterial, antiviral, and antioxidant , and olive oil is an anti-inflammatory comparable to NSAIDs like Tylenol (but without the side effects!). Garlic is a staple in my kitchen and most (if not all) of my savory meals! You can use it to help treat acne and asthma, high blood sugar, blood pressure and cholesterol, ear aches and eye infections, and the common cold and flu. You get the most out of garlic if you chop it up but keep it raw! Tamari is the gluten-friendly version of soy sauce! It contains protein, vitamins and minerals that help your body digest fruits and veggies, and it has a lot less salt in it than soy sauce. Ginger is another staple in my kitchen. You can use it for muscle, stomach or PMS pains, and it helps your heart stay healthy in all ways. Maple syrup is the healthiest sugar for your body. It’s a sweetener you can feel good about (in moderation, of course)! It helps your heart, skin, digestive and immune systems. And it’s damn delicious. Last but not least, cashews help your bones, healthy blood cell creation, immune system and that beautiful brain of yours! So, yeah, I’m in love with this new recipe. Here it is... 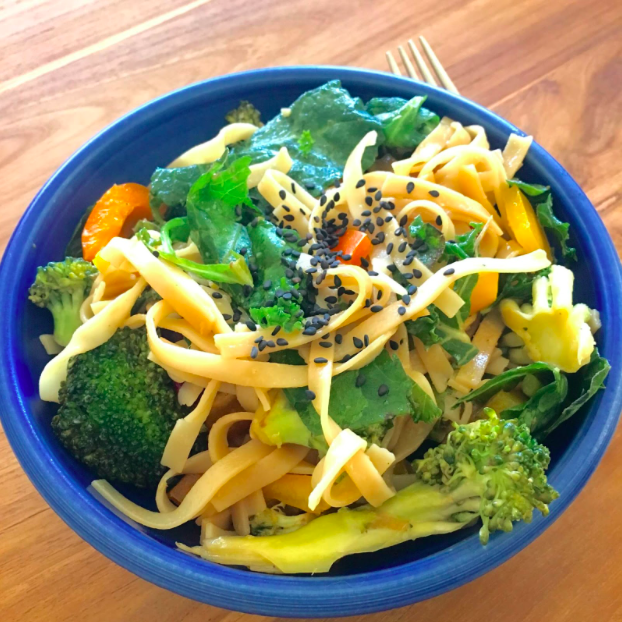 The Zesty Veggie Noodle Salad! Make a marinade using sesame oil, olive oil, tamari, minced garlic, finely chopped ginger and chili pepper, maple syrup, and salt and pepper. Let it all sit. Cut up the broccoli and fry in a pan for a few minutes with some grape seed oil and a dash of tamari until cooked well (you still want the broccoli crispy!). Rinse the kale and the spinach. In a big bowl, tear up the kale and start massaging with the lime juice and some salt and pepper. Massaging the kale breaks up the enzymes and makes it less bitter and tastier to eat! Then add the spinach as is. Chop up the bell peppers into chunks and add to the bowl. When the water is boiling, turn off the heat and cook the rice noodles according to the instructions on the box (usually they just sit in the hot water for a few minutes until they are ready – make sure to not overcook!). When the noodles are ready, add the marinade to them and stir well so all noodles are immersed in the yummy, sesame/tamari mix. Then add noodles to the kale, spinach, and finally add the broccoli. Add a handful of cashew nuts, mix well and enjoy! I added some black sesame seeds on top but as with everything, it’s optional. If you like cilantro, this dish is delicious with a bit of cilantro on top. Nom! Check out Nourish on OneOEight.com for many more delicious and easy recipes! How did your zesty salad turn out? Better than takeout, amiright?! Share with us below!